The days of winter are passing quickly. I have had such fun turning my dream into something solid, although a bit small. The model of Tòti Bleu is finished. 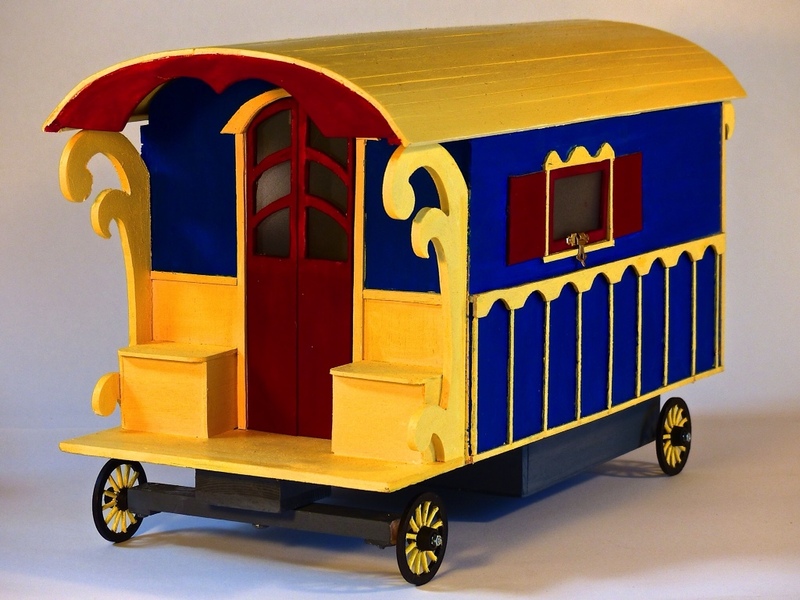 It is 40cm long by 20cm wide, allowing me to judge the proportions and interior space of the finished large scale caravan, (The chassis will be 4 meters by 2 meters). Livable space is 320 cm by 2 meters. Building this model helped me to make many decisions now while waiting for spring and the chassis to arrive. I began by drawing everything to scale on paper and then built the model using my drawings. There were many changes along the way! 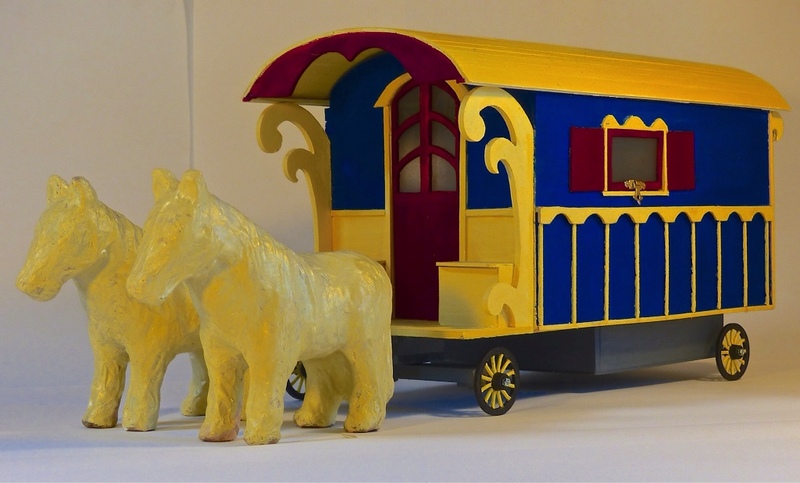 The challenge is to keep the final caravan as lightweight as possible. The wagon should not be heavier than the horses. There will be a large storage box underneath between the wheels. The wheels shown on the model are smaller than they will be in reality. 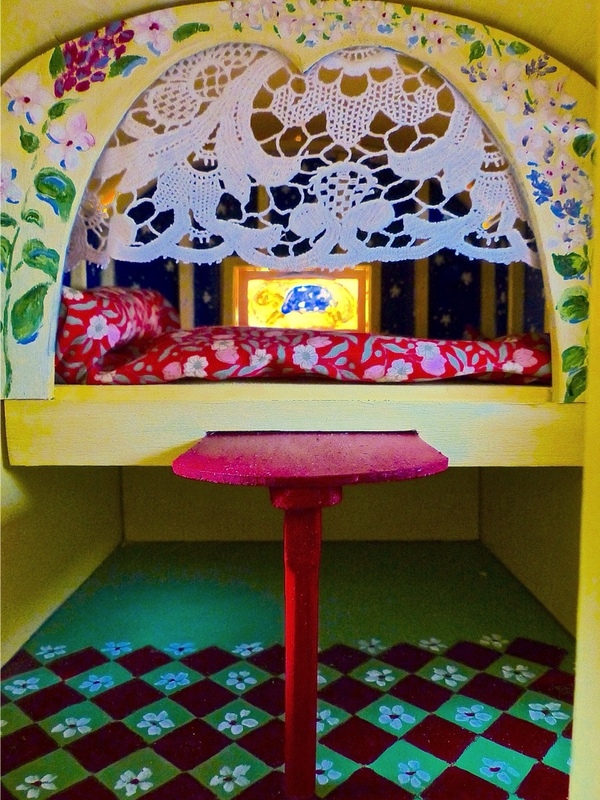 The privacy wall for sleeping, stained glass window, pull out dining table: I plan to have drawers on either side of the table and a colorful curtain hiding the underbed storage area. 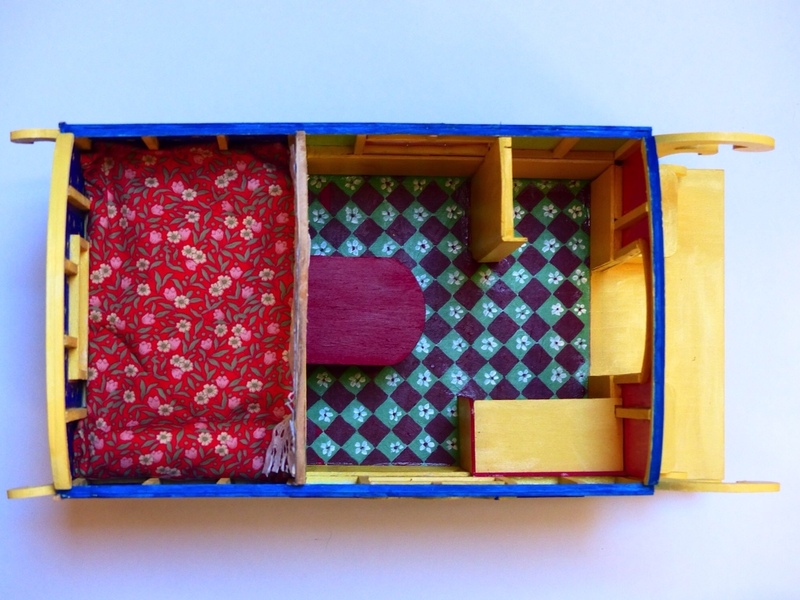 Floor plan: The bed is large enough for two adults. Chairs will be foldable, lightweight and easily stored under the bed when not in use. I made a small chair to scale for the model. That helped to judge space a bit better. Privacy wall (upper right hand corner of photo) with curtain for a camper toilet. The kitchen counter will have a small sink, under the counter water storage with footpump for the sink, and a cooler. I like the idea of using small wallhanging hammocks for storage. Rear view: There will be hooks for attaching a hay net. Front view showing seats which will double as storage boxes. The doors will be dutch doors opening outwardly. The roof will have a solar powered ventilator. The walls are 160 cm high but there is 2 meters headroom in the middle. 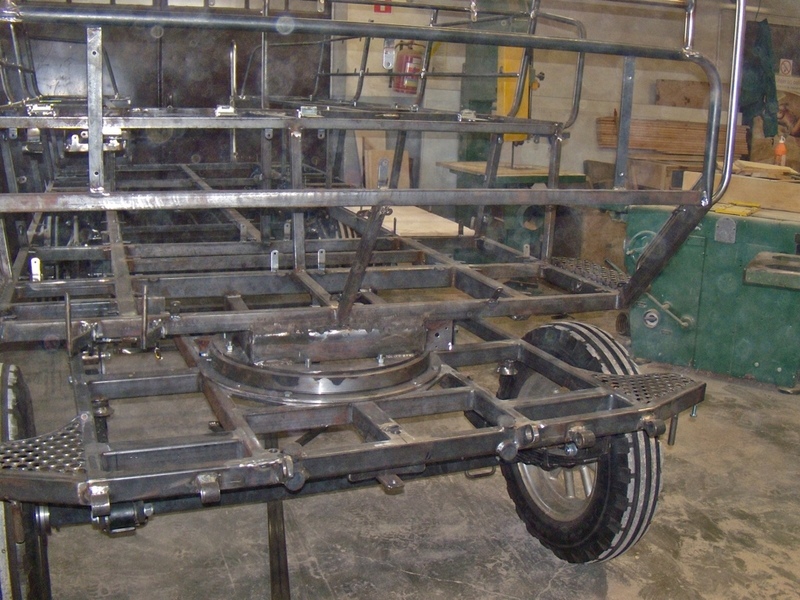 This is a similar chassis to the one for Tòti which was under construction when I visited the factory in Poland. It shows the wheels and front end construction with the front angling up. There are 4 wheel disc brakes plus emergency brake, battery powered lights and a large storage box underneath between the front and back wheels. American living in France. Artist and lover of nature, gardening, all living beings. Married to the love of my life, mother of two wonderful daughters and grandmother. 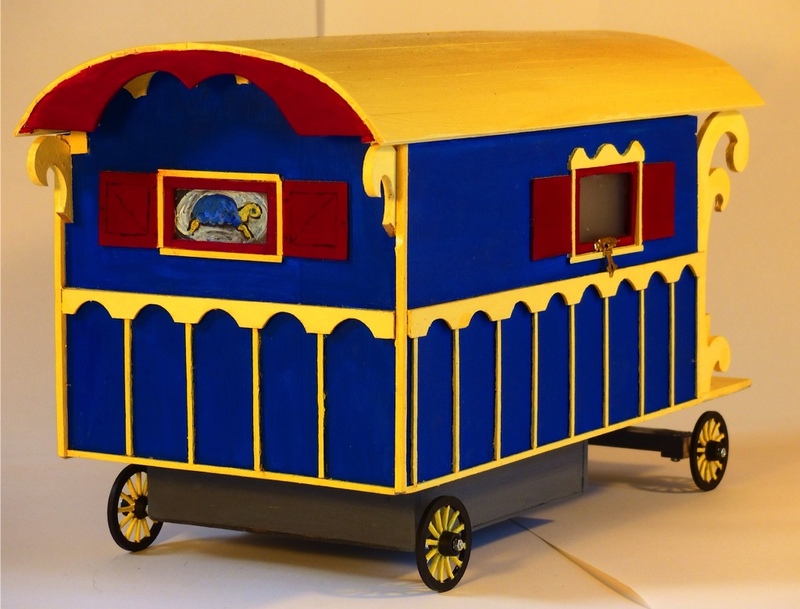 This entry was posted in Lifestyle and tagged building a gypsy caravan, Scale model of a roulotte. Bookmark the permalink. Thanks Maria. I’m hoping you will be here to help with the horses. 150 pages in full color full of practical information & inspiration! Click the image to buy from Amazon or visit the US distributor HERE for Suzanne to receive a higher return! (US destinations only) $24.95 incl. US postage. WA residents, sales tax will apply. Thank you! TOTI BLEU $7.99 (9.9mb) Digital Download. Thank you!